I hope you find yourself surrounded by those you love in rooms filled with laughter and yards filled with eggs. Our family has always enjoyed this holiday for it's truest reason, much like Christmas. And then there's the egg hunt, can not leave out the egg hunt. fingers crossed for a no-rain day. The youngest of our group are now old enough to understand the fun in Easter. I can hardly wait to watch them fill their baskets! From VA to Hawaii back to VA we've spent Easters covered in snow, sunshine and sand. To see Lance grow through these years along with his cousins made my little heart melt tonight. Check out his surfer hair from Hawaii days!! What's more fun is his face at the dinner table. Not much changed in 5 years. Apparently Lance is one happy kid at the dinner table or us adults take far too long cooking the meal?! Landon's first Easter was in his own home. You can barely see him in the picture, he was just days old! This was the first Easter celebration I threw for my family. 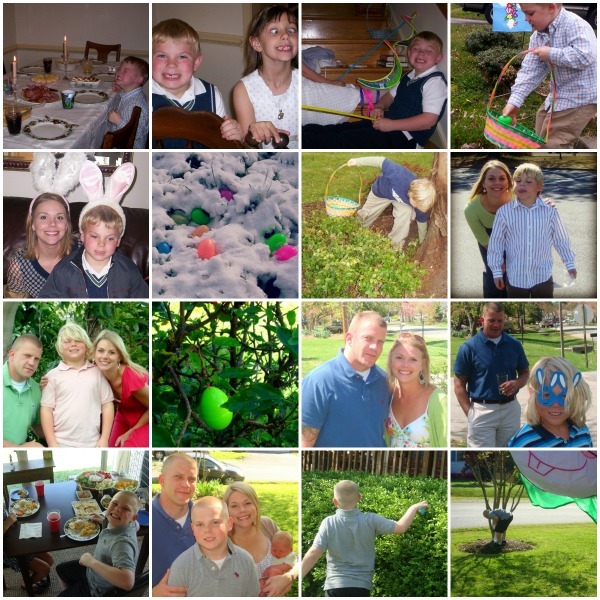 I don't know what got into me that year but somehow I pulled it off, and yes, Lance will never be too old for an egg hunt! Last year we were able to spend the holiday at my sister's beach house. My brother and his family had since moved to Nevada but were able to fly home for the Easter weekend. I can't even describe the happiness my parents felt this week. Really, we all did. My sister, brother and I are the best of friends. Our children are close in age and love each other like best friends too. The 15 of us spent a long weekend together counting it all...bible verses, Carova horses, eggs, kids, seashells and our blessings. See you soon with a weekend recap and more fitspo! 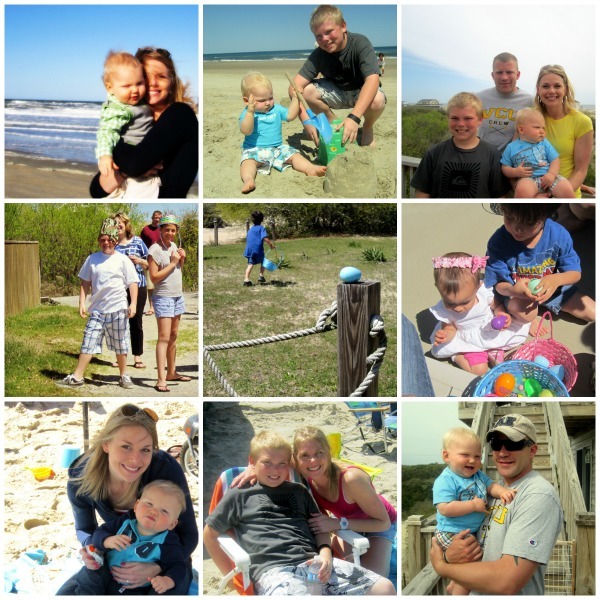 It's so fun to looks at old pictures and see how the family has changed throughout the years! Hoe you enjoy your Easter!! Such cute pics!! The 2012 collage is my fave! Hope y'all are having a wonderful day! Wish I lived closer to get dibs on your leftover deviled eggs! Yum! I'm visiting from Super Sunday Sync. The pictures are great! Happy Easter to you. Awww It's great seeing the boys grow! I love Easter.